I have always been interested in the prospects of using VR headsets to watch regular movies. But the problem is that you have to use a special app on your phone to split the image in two, losing quite a bit of resolution in the process. Because the headsets are made for 360° videos, if you turn your head, the still image has to be readjusted. When I was searching for a solution to these problems, after testing out a cheap cardboard VR viewer, I came across the MovieMask, which was made by a team of young inventors in Norway, and successfully funded through a couple of crowdfunding campaigns. As the story goes, they were inspired to make it after seeing The Hateful Eight in theatres, and wanted to find a way to replicate the experience of watching something on the big screen in a darkened theatre. “Your personal cinema experience on the go,” is how they sold it. 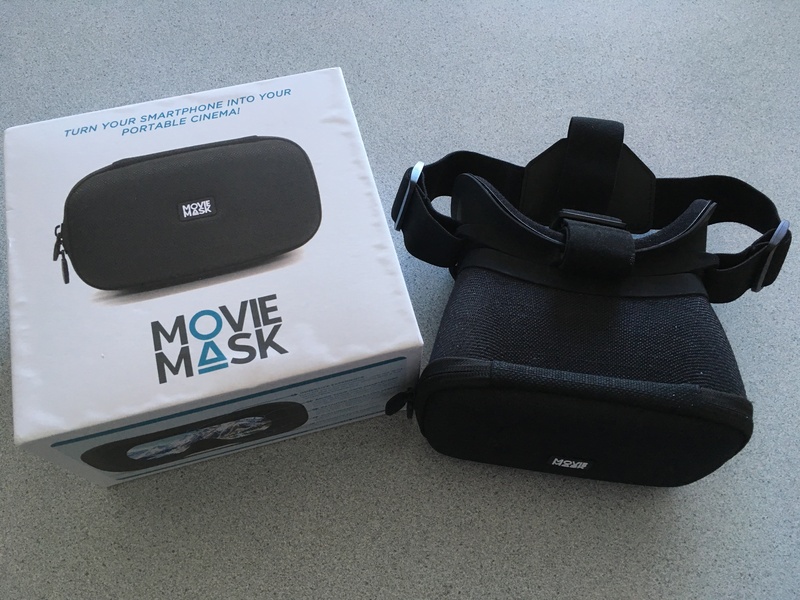 So I recently reached out to the makers of the MovieMask, and much to my surprise, I got a message back from Harald Manheim – the CTO and one of the co-founders of the company – who was kind enough to send me the MovieMask Premium for review. I have been testing it out over the past few weeks, and have to say that I’m thoroughly impressed with the quality of the product. As you can see in this video, the headset itself looks pretty similar to other VR viewers, with one key difference. The MovieMask uses special optical lenses, which were designed with the help of opticians, so that what you see is one solid image. Which means that you don’t need any special apps, and the image isn’t split in two. You can just watch regular 2D content from whatever apps you have on your phone, including iTunes, Netflix or YouTube, while retaining the full resolution. The actual construction of the headset and the materials used are very sturdy, and looking through it does give you the illusion of watching something on a big screen. It’s also really easy to use. All you need to do is unzip the back of the unit, pop your smartphone in between the universally sized mounts, zip it closed, and put the device on your head using the adjustable straps. That’s it. Within a minute of taking it out of the box, I was already watching my digital copy of Cars 3. The headset comes in a choice of three colours – Polar Night Black, Granite Grey and Glacier Blue. I opted for the Polar Night Black, which I find has a nice sleek look to it. You can tell that a lot of time and effort went into the product right from the packaging itself. It comes in a sturdy white box that recalls the sort of packaging you would get from an Apple product. The box also comes with a conveniently sized carrying pouch, which will come in handy when travelling with the device, as well as a soft cleaning cloth to wipe any fingerprints or dust off of the lenses. This video provides a really accurate depiction of what you actually see through the lenses. The image is surprisingly sharp and clear, giving you a wide field of vision. I would say the image is somewhat similar to staring directly at the screen in a pitch dark theatre. When you look through the lenses, you see the darkened sides of the MovieMask around the screen, which really helps add to this illusion. I’ve been using it with my fairly new iPhone SE, which is a bit on the small side, but it will easily fit phones with larger screens as well. You can adjust the focal length between the lenses and your phone screen by up to several centimetres, simply by unlocking the small dial on the underside of the device, and pulling the mask part out a bit. It worked pretty well for me at the closest distance, but depending on what I’m watching, I have also found it more comfortable to extend it by about a centimetre. It’s actually pretty easy to get the hang of doing this while the device is strapped onto your head. Because there are no built in controls on the MovieMask itself, it’s best to use it with headphones that have their own play button and volume controls. I’ve been using it with the earphones that came with my iPhone, and it’s been working out just fine. The double zippers make it very easy to leave a small opening for the headphone wire, without really allowing any extra light to get in. I’m happy with the MovieMask Premium, and would recommend it. I have a huge selection of movies on my phone thanks to the digital copies that come with most Blu-rays, and this offers a way to really take advantage of them. I have tested it by watching a variety of different things, including shorts, feature films, live action and animation, with some pretty satisfying results. While the benefits of watching a character drama on it are less pronounced, it’s a real trip to put on something like Mad Max: Fury Road, and have the action unfold right in front of your eyes. I have also used it to watch some live performances and concert footage, which looks really cool. 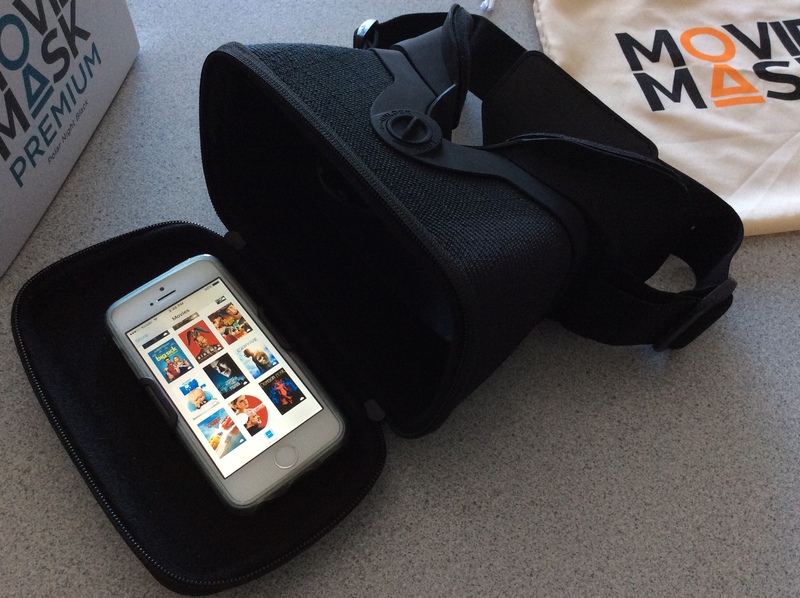 The benefit of the MovieMask is being able to watch videos on your phone in a way that makes them appear bigger than the tiny screen in your hand, and it’s also a convenient way to watch movies without being distracted by other things around you. It really comes in handy if you want to watch stuff during the day without having to deal with the glare of outside light on your TV or computer screen. I can also imagine using it while travelling. As shown in one of the videos above, there is also a smaller, more compact version of the device available called the MovieMask Go, which is made of collapsible rubber and doesn’t have head straps. I haven’t personally tested it out, but presume it is of similar quality. If you are looking for a fun new way to watch stuff on your phone, without the aforementioned drawbacks of using a regular VR headset, then I would wholeheartedly recommend the MovieMask Premium. It’s an impressive and very well made product that is a lot of fun to play around with. Oh, and I couldn’t resist watching the Ready Player One trailer on it, which looked awesome. You can find more information on the MovieMask on the company’s official website right here, and you can check out their two crowdfunding campaigns here and here. I have also included a selection of my own unboxing photos below to give you a better sense of what you get.